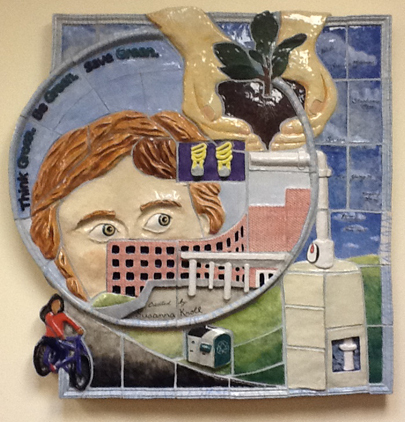 Bas-relief ceramic collage that illustrate significant sustainability efforts at Babson College. • Mandell Family Hall – This Energy Star Building uses 40% less energy than other buildings its size on the Babson Campus. • Lights – Babson has undergone lighting efficiency upgrades to a majority of its buildings on campus. These conservation projects will save Babson 258,622 Kilowatt hours a year. That amount of energy saved in just one year could power an average American household for 11 years. • Big Belly Solar Energy Compactor– Managed in part by a Babson and Olin College student/alumni collaboration, Big Belly makes solar powered compacting trashcans for outdoor applications. Babson is home to several Big Belly units. By compacting trash, Big Belly trashcans reduce the number of truck trips and bags required to empty outdoor garbage containers. • Bike Share – Green Tower, a special interest housing organization on campus, started a bike share program at Babson to encourage students to ride their bikes around campus and around the town of Wellesley. • An energy efficient water heater. • A gardener (Babson has a community garden and a great diversity of trees). • A person with an idea, represented by compact fluorescent light bulbs. After all, without ideas, sustainability efforts cannot continually improve. and Stephanie Osser, who all spent countless hours working on this labor of love. Several other students dropped in to lend a hand.